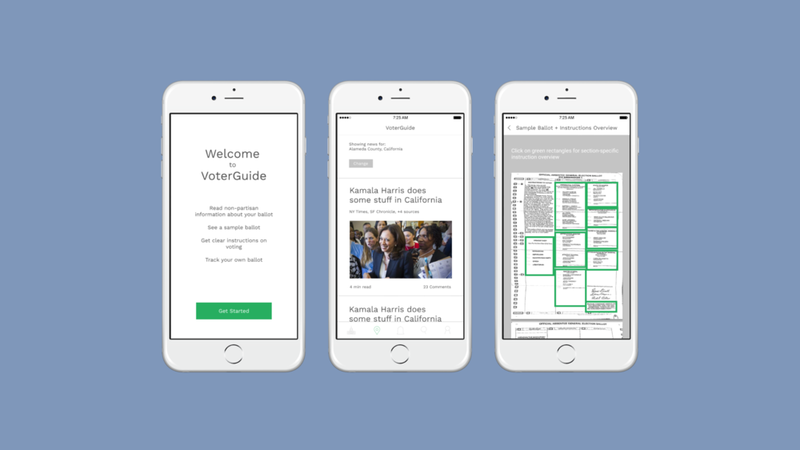 For a design foundation class at UC Berkeley that I took in the Fall 2016 semester, I worked individually on a redesign of the absentee voting experience in the United States. I wrote extensively about my process on Medium, where you can find a breakdown of each phase of the project. The absentee voting system in the United States is incredibly difficult to navigate, has high barriers to entry, and is plagued with issues such as lack of accessibility, unclear directions, and little attention to visual design. Along with secondary research, I conducted 2 contextual interviews with two college-aged absentee voters, one from Pennsylvania, and another from New Mexico. Additionally, I looked into the California and New Jersey absentee ballots. People want a general sense of trust with the process – people don’t like it when ballots are sent late, or may not arrive in time, and people want to know that absentee voting is a valid way to participate in democracy. With my interviewees specifically, the ballots being sent late gave both of them some level of nervousness or stress. The amount of time voters are willing to put into absentee voting depends on the activity. People are willing to take the time to make informed decisions about voting, but they’re less patient with having to fill out personal information that their county should already know. From research, I learned that people want to trust the absentee voting system and put in the effort necessary to legitimately participate in democracy, but the current system was plagued with issues from late ballots to postage costs, to unclear instructions. With these insights and observations in mind, I began to develop different ideas to improve the absentee voting system. After initial ideation, I was at two main concept directions – one was to overhaul the physical ballot, rethinking its visual and experience design, and the other was to digitize the entire absentee voting process. However, after considering issues with both of the design directions, I arrived at a somewhat different direction – design a digital platform/companion that would serve as a guide for voters. I began to make some initial sketches of the user's journey through absentee voting along with the journey through the digital voter guide. The digital voter guide would serve as a single platform with various resources that I found that absentee voters wanted, including deadline reminders, a source of nonpartisan information about ballots, clearer instructions, and potentially, ballot tracking. I also began to create some mid-fi wireframes to better understand the layout and experience for the guide. Lastly, as the final deliverable for the project in class, I created high fidelity mockups and tested a working prototype of the guide. I need to do more research on many more use cases, and especially conduct more interviews with different types of voters, outside of the college student population that I interviewed. I mentioned that an interviewee said that filling out the ballot in pen made them “nervous,” and I realized that I never dug deeper to truly understand where that emotion came from. In the future, I want to improve my questioning in order dig deeper at what specific interactions or subtleties are causing interviewees to express certain emotions or reactions. Very early on on the project, I had concerns about time restraints, laws about ballots, feasibility, and other issues. However, while it is important to define reasonable constraints before ideating and refining, I learned that I shouldn’t constraint myself too early on in the process and potentially lose out on exploring different spaces and ideas. Communicating ideas in print is incredibly different from doing so digitally — I had to print materials from this project each week for critiques in the class I’m taking. While I didn’t really discuss this issue in my writing on Medium, designing for materials to be pasted on a wall was a huge departure from considerations that I usually have to make in digital design.